Phil retired as the Deputy Director of Finance and Administration for the San Francisco Human Services Agency. Prior to that position he worked for the San Francisco Public Utilities Commission (PUC) and the San Francisco Recreation and Park Department. He is the current Board Chair of the Bay Area Ridge Trail Council, which is implementing a 550 mile trail around the ridgeline of the San Francisco Bay. Phil is an active runner, swimmer and sailor and uses the parks regularly. He lives with his family in Golden Gate Heights. A former banking industry vice president, Brian worked alternatively as a Product, Program and Project Manager before retiring from the corporate world to focus on family and philanthropy. Raised in the foothills of Colorado, Brian and his wife have moved all around the US and Germany, declaring San Francisco their home in 2004 – and never looking back. Ten years of living near Golden Gate Park opened Brian’s eyes to the importance of green spaces in the urban landscape; the birth of his daughter taught him the further importance of safe, modern, easily-accessible playgrounds. Brian earned an MBA from the University of Southern California and a Bachelor’s Degree in Economics from Northwestern University, in Evanston, IL. Brian, his wife and daughter love to travel, ski, hear live music and embrace everything that life has to offer. Ms. Barry is originally from Rye, New York and attended Greenwich Academy and Yale University. At Yale, she was a four-year varsity lacrosse player, and Academic All-Ivy her junior and senior years. She also recently earned a degree as a holistic health coach at the Institute of Integrative Nutrition. Ms. Barry has lived in the Bay Area since 1997 and now resides in San Francisco with her husband Stewart and four children. Ms. Barry's professional life has followed her interests in fine arts, publishing and nutrition. Ms. Barry was a client relation manager at Sotheby's and has held editorial positions at Meigher Communications and eLuxury. Today, she is a dedicated holistic health coach, advising families on health and wellness as well as teaching cooking classes at the San Francisco Cooking School. Ms. Barry is also active in civic life. At the Burke's School, Ms. Barry has chaired both of the key annual fundraisers, the Annual Fund and Spring Gala Auction. Ms. Barry serves on the California Academy of Sciences Friends Steering Committee and has served on the Discovery Museum Council, where she chaired the annual Halloween fundraiser. Caroline is the owner of CHB Art Advisory, an art consulting business. Her company specializes in educating both new and experienced art collectors about emerging artists, curating their collections and acquiring art. Prior to starting CHB Art Advisory, Caroline worked for a leading contemporary art gallery in Seattle and Christie's Auction House in New York City. Caroline spent 6 years at Christie’s working in both the Impressionist & Modern Art Department and Post-War & Contemporary Art Department.In between Christie’s and starting CHB Art Advisory, Caroline helped establish San Francisco Cooking School, a local culinary school that partners with the best restaurants in San Francisco to train culinary and pastry students. Caroline attended the Hamlin School, the Urban School and the University of Washington. She is on the board of the Bay Area Discovery Museum. She is also a member of the Hamlin School Alumnae Board. In addition to her board positions, she is actively involved in two non-profit organizations, Raphael House and the Edgewood Center for Children and Families. Caroline lives in San Francisco with her husband, Robin Brinckerhoff, and two daughters, Reese and Isabelle. Rosemary Cameron has spent her career working in the public sector with management experience in regional and municipal parks and recreation, city management, legislative affairs, and communications. Rosemary retired from the East Bay Regional Park District in December 2010, leaving her post as Assistant General Manager, Public Affairs. She served as Executive Director of the Regional Parks Foundation from 1993 to 2010. Under her leadership, the Regional Parks Foundation raised over $20 million to support the East Bay Regional Park District’s parks and programs. Rosemary continues to consult, and speaks on marketing, branding, communications, social media, and fundraising at professional conferences and trainings. Rosemary holds a Bachelor's degree in Economics and Government from Mills College, and a Master's degree in Public Administration from the Maxwell School at Syracuse University. Her volunteer involvement includes serving on Save the Redwoods League’s Board of Councillors; on the California Parks and Recreation Society’s PAC; and as a member of the California Roundtable on Recreation, Parks and Tourism. Nancy Conner joined the Board of Friends of Recreation and Parks in the late1970s and has been an impassioned proponent of parks ever since. Her proudest park moments include the Parks' Fun Raiser Campaign, co-founding the San Francisco Landscape and Garden Show at Ft. Mason, the Conservatory of Flowers Campaign, writing the brochure for Coit Tower, and, as chair of the Golden Gate Park Concourse Authority, helping to win public approvals for the Music Concourse garage in Golden Gate Park. She has been a docent at the San Francisco Botanical Garden, co-author of "Where on Earth: A Guide to California Nurseries", and on the Board of the Presidio Trust. She has been married to Ed Conner for 45 years and their three sons are grateful park users. As Senior Vice President of Global Consumer Marketing at EA, Carolyn Feinstein is responsible for the management of creative/content development, media strategy and buying, agency management, acquisition marketing activities and EA's music business division. Feinstein’s team is dedicated to creating the most dynamic, relevant, and productive dialogue with EA’s players – driving emotional impact across EA’s diverse portfolio of console, PC, and mobile games. Prior to her current position, Feinstein led EA’s Marcom functions and held a role in product marketing, as the Director of Sports Marketing for key EA SPORTS franchises including Madden Football, NCAA Football and NASCAR. Feinstein joined EA as the Director of Consumer Promotions and was tasked with creating partnership-marketing opportunities to drive trial, awareness and incremental media value for EA’s packaged goods business. Prior to joining EA, she spent six years in Brand Management and Sports/Entertainment marketing at E. & J. Gallo Winery. Carolyn received a B.S. degree from Union College and a M.B.A. from Kenan Flagler at UNC-Chapel Hill. She lives in San Francisco with her husband, son and twin daughters. Liz has twice been co-chair of the Parks Alliance Party for the Parks Committee, most recently in 2017. She is actively involved in the San Francisco Shared Schoolyard Project and is a member of the board of directors of the Stern Grove Festival Association. Liz is a writer/columnist for the Marina times and lives in the Jordan Park neighborhood with her husband Mayor Mark Farrell and their three children. Christine Gardner lives in San Francisco with her husband and three young children. She is the founder of an environmental health consulting company called moregreenmoms and recently published her first children’s book, A Moment of Quiet is Nothing to Fear. A graduate of Stanford University with BAs in both Communication and French Studies, Christine has worked in diverse fields including publishing, investment research and Internet development. She is a co-creator and parent representative for the Eco-Councils at her children’s schools and she is presently the Chair of the Bay Area Green Schools Alliance, a collection of parents, educators and change-makers working together to promote sustainability practices on private and public school campuses throughout our community. 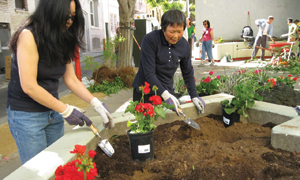 As a former Board member of the San Francisco Parks Trust, Christine was co-Chair of the past three Party for the Parks events, and she helped launch programs such as the Gear-Up program to outfit rec centers with equipment and the Parks ReStore concept to allow supporters to directly purchase tools and supplies for our City’s gardeners. Christoper Guillard is a founding partner of CMG landscape architecture, an award-winning San Francisco-based design practice that provides planning, design and management services to a wide range of public, institutional and private clients. His work and research is focused on the value of public open space and urban landscapes that support local and regional efforts to improve the environment and build a more sustainable, economically vital and livable city. Chris’s passion and commitment to vibrant public space and sustainable design has benefited projects such as Treasure Island, Mint Plaza, and the Crocker Amazon Playground as well as numerous pro-bono projects in San Francisco. In 2001 he received the outstanding alumni award from the College of Architecture and Urban Studies at Virginia Tech. Chris is active in the San Francisco planning and design community and has provided pro-bono services to numerous San Francisco communities. Chris formerly served on the Board of Directors of the Neighborhood Parks Council, and served on the Board of the Parks Alliance from its inception in October 2011 through September 2012. He lives in Supervisor District 9. Sophie Hayward is the Director of Policy and Legislative Affairs at the Mayor's Office of Housing and Community Development. Before joining MOHCD, Sophie worked for eight years at the San Francisco Planning Department. As a LEED accredited city planner, Sophie served in numerous capacities, including as legislative and policy analyst, and as an historic preservation planner. Prior to moving to the public sector, Sophie worked as an architectural conservator as a Getty Conservation fellow for international projects, and for the New York City firm Jablonski Berkowitz Conservation, where she worked as a Senior Conservator to develop preservation, restoration and rehabilitation strategies for sites such as the Lower East Side Tenement Museum, the Cloisters, and the Plaza Hotel. Sophie resides in San Francisco's Richmond District with her husband, Boe Hayward, and their three young children. Anne Herrera, a real estate agent with Sotheby's International Realty, is a native of California and San Francisco resident for more than 25 years. Previously, she worked with Bank of America and Intel Corporation. Anne and her husband, City Attorney Dennis Herrera, are deeply committed to the city. Raising their 13 year old son, Declan, has made Anne aware of the challenges and opportunities families face in the city. Jaime Jones is a CPA and a senior manager at PriceWaterhouseCoopers (PwC) with over 14 years of experience serving both public and private national and multinational clients in PwC’s Assurance practice. Jaime has a diverse background serving multiple industries with experience serving Fortune 500, SEC registered companies in engineering and construction, consumer goods, accounting and professional services and utilities industries as well as one of the largest institutions in higher education in the world. Over the past several years, Jaime’s clients have included some of the largest and industry leading companies and organizations. Prior to joining the PwC San Francisco practice, Jaime served clients out of the St. Louis and London offices. During her tour in London, Jaime led the audit of a large worldwide client, as well as developed skills in international financial reporting standards, which she brought back to the U.S. by investing time presenting to clients and at universities. Jaime has a Master’s Degree in Accounting from the University of Missouri – Columbia. She lives in Supervisor District 2. Jasmine Kim is an innovative builder of brands and businesses that bring value to consumers worldwide. She is currently engaged with HLB LLC, a privately held company that manages and operates a portfolio for consumer Internet media and commerce brands in the health and wellness category. She is a results oriented leader who has created and scaled multiple businesses, with such storied brand companies as Oil of Olay, Procter & Gamble, LVMH, Yahoo!, BabyCenter, and Hotwire/Expedia. Courtney has been a resident of San Francisco for over 15 years. She and her husband, Eric Prosnitz, own the Sports Basement and are avid outdoor enthusiasts who frequent the city’s open spaces with their three daughters predominantly for soccer games, running, and hiking. Courtney is passionate about supporting the broader San Francisco community in embracing a healthy and active lifestyle with an emphasis on engaging underserved youth. Past employment included product management in the internet industry and account management for advertising agencies. She is a graduate of Colgate University, BA, and Harvard Business School, MBA. Jenny is the State Engagement Manager at Education Superhighway. A second-generation Chinese American and Bay Area native, she has devoted her career to social change and public service. Prior to joining Education Superhighway, she served as Director of Programs at Chinese for Affirmative Action in San Francisco, the Executive Director of GirlVentures in San Francisco and prior to that worked at the Oakland Asia Students Educational Services (OASES), serving in various leadership roles, ultimately as Deputy Director. Jenny has served on several Public Commissions including the San Francisco Redistricting Taskforce and the Co-Chair of the Public Education Enrichment Fund, San Francisco's Unified School District. She has also served on the Board of Directors for nonprofit organizations, most notably the National Asian Pacific American Women's Forum (NAPAWF) based in New York City. Jenny lives in San Francisco with her husband and two children, both attending San Francisco public schools. After a lengthy stint in local politics and non-profit work, Meagan Levitan has turned her love for, and knowledge of, San Francisco into a profession as a realtor with Hill & Company Real Estate. Meagan served as an appointed member of the San Francisco Recreation and Parks Commission and currently serves on the boards of the San Francisco Neighborhood Theater Foundation, Little Sisters of the Poor St. Anne’s Home and Broadway Alumnae of the Sacred Heart. Meagan is a native San Franciscan and a Stanford graduate, living in the Richmond district, off Lake Street, in the same house where she was raised, with her husband and two daughters. Brook Mebrahtu is a Senior Project Manager with the Department of Public Works. Kelly Nice is a Founding Partner at Nice Advertising, a leading independent ad agency in San Francisco. He first got involved with San Francisco’s parks in 2002, helping on the campaign to restore the Conservatory of Flowers in Golden Gate Park. As Vice President of San Francisco Parks Trust, Kelly served on the committee that initiated the merger between SFPT and Neighborhood Parks Council. He served as the Board Chair of the SFPA from 2013 to 2016. Kelly lives near Allyne Park and is a frequent cyclist and runner in Golden Gate Park. Jonathan Rewers has many degrees and has worked in many different places. Despite all that, his one goal in life is being of service to his friends, family, community, and colleagues. Parks and Recreation is a pure expression of that goal, which is why he has promoted and supported it in all ways possible – as a volunteer, advocate, and professional. He currently works as the Manager of Capital Financial Planning and Analysis at the SFMTA, and is pursuing a graduate degree in Urban Planning. He grew up in San Francisco and played his childhood away at San Francisco’s world-class parks. Melanie is a land use, environmental, and litigation attorney at Holland & Knight LLP. Tim is Managing Director at NBS, a public financing consulting firm. A San Francisco resident for almost three decades, he has over twenty five years of professional experience in local government consulting, business, and management, working at the Clorox Company, MuniFinancial, Inc, and Dreyer's Grand Ice Cream. He has served on the Board of Friends of the Urban Forest, East Bay Center for Performing Arts, and the Haight-Divisadero Neighbors and Merchants Association. Glenn is a partner at Pillsbury Winthrop Shaw Pittman LLP. He has been working with Friends of Rec and Parks, the San Francisco Parks Trust, and the Parks Alliance for over 20 years, supporting its mission of enhancing city life through recreation and open spaces. John is a retired management consultant and active park advocate for the past ten years through Board service with the SF Parks Trust and SF Parks Alliance. He has also throughout that time been an informal steward of the Japanese Tea Garden, serving on a joint committee with the SF Rec and Parks Department responsible for assessing the assets of the Tea Garden and later establishing the Friends of the Japanese Tea Garden, a Park Partner of the Parks Alliance. Lee Anne is the Owner of Late for Yoga, Ltd., an advertising and production service company. She, her husband, and their two sons consider themselves "power users" of the San Francisco Rec and Parks system, and are committed to staying in San Francisco and doing what they can to make it a livable city for all.